The world was shocked on Tuesday when several attacks on Brussels were carried out. With explosions at Brussels Airport, and a city center metro station, more than two dozen people are reportedly dead, and as many as a 100 more injured. Happening only months after the Paris attacks on Nov. 13, 2015, members of the public have taken to social media to share their support for those affected by the devastating attacks. Many of the memes, images, and cartoons being shared are inspired by one of the most iconic statues in Brussels, and the Manneken-Pis memes are incredibly beautiful and particularly patriotic. Several popular memes have been circulated, including a cartoon by French artist Plantu, but many images feature the Manneken-Pis, and for important reasons. 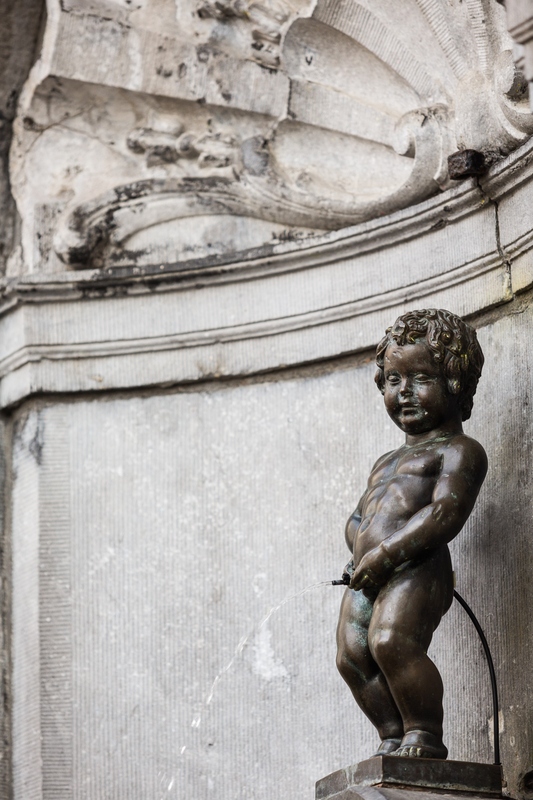 According to the official City Of Brussels website, "The famous Manneken-Pis remains the emblem of the rebellious spirit of the City of Brussels." First introduced as a drinking fountain, the statue is now an iconic symbol in the city, which gets dressed up in various costumes throughout the year, and is "an image and symbol of the Brussels folklore, the joy of the inhabitants and their capacity of self-mockery [sic]." That the people of Belgium are responding to the Brussels attacks with sharp satire shows their resilience and refusal to let such devastating events destroy them. Here are some of the best Manneken-Pis memes, cartoons, and images. The Manneken-Pis takes aim at a bomb, proving that the people of Brussels refuse to accept attacks like the one on Tuesday. In a beautiful and simple line drawing, the iconic Brussels statue shows his opinion on gun violence. Artist Aflonso Ponce drew the Mannekin-Pis in prayer for the people of Brussels. In a colorful meme, the stars from the EU symbol surround the head of the Manneken-Pis, proving that Brussels has a lot of support. Understandably, several of the memes and cartoons embody the sadness felt by the nation. In this one, the Manneken-Pis holds the Belgium flag, and weeps. Many artists are showing that Brussels will not buckle or break following Tuesday's attacks. Translated as "unity is strength," in this image, the Manneken-Pis stands tall, proving that Brussels has so much support from around the world. Following the deaths of so many civilians in the Brussels attacks, the general public is in mourning. Aiming at an individual in a mask, the Manneken-Pis proclaims, "Your gift from Belgium!" There are tears, but Brussels will not give up. The world stands with Belgium. ISIS is highlighted in this meme, showing an ongoing commitment to stopping terrorist groups. The Manneken-Pis proclaims "This is too much!" which encapsulates how we all feel about this devastating situation. By refusing to be silent, artists on social media continue to show their support for the people of Brussels.